2017 Note: Though this was written several years ago, its equally relevant today. It's been my most requested keynote and on-site workshop. How much is an idea worth? Apparently enough that some companies are now adding the skill of innovation to each employee’s performance evaluation. Wow! Innovation? Yep. In essence what’s being expected from every “rank and file” employee in some corporate settings is the ability to come up with ideas (not to mention the need for critical thinking skills as well). I believe that this ability – the ability to generate ideas and to problem solve – will be a key deciding factor in whether to hire or retain certain employees. Ok…I might be getting ahead of reality here, but wouldn’t that be an idea worth implementing in some way? I do believe it can happen -- but only if companies begin to see and experience that creativity is a skill -- a skill that can be learned! Well, some leaders in top companies have already embraced that notion. In a study conducted by the IBM Leadership institute, it was revealed that 1500 CEO’s identified creativity as the most essential leadership competency in impacting the success of their companies going forward. I think that might surprise some. Yet it was a necessary choice. In our current economic climate what would be the most compelling “skill” in all work sectors but the ability to generate ideas for any pressing challenge and to innovate ourselves out of a lagging economic recovery. However, here is a piece of reality from my world. As I’ve traveled through-out North America these past 13 years conducting creative and innovative thinking workshops, most people I’ve encountered don’t believe they are creative let alone have a practical way of being so as it applies to real-life enterprise challenges. Just recently, I was conducting a creativity workshop for a company whose industry is going through some major changes. There were over 45 of their top leaders there and when asked, “How many of you honestly believe you are creative?” …5 of the 45 raised their hand. Houston – we have a problem. Some reading this might be thinking, “Well not everyone is creative.” Oh contraire my friend. The exciting point is everyone is creative in some way - it’s consistently proven in my workshops. The sad reality is not very people know it or believe it and even fewer have been taught how to be so – practically. Creativity is not reserved for the “artsy fartsy” folks! This belief truly blocks the non-artsy from embracing and tapping into their own creative potential. Essentially, it is a critically relevant skill that must be incorporated into all company cultures – top leadership on down. It should no longer be seen as an unapproachable, optional capability. 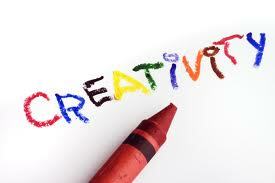 In it's simplest form creativity is about generating ideas and we all have done that! It's also about problem solving and we've all done that as well. Creativity asks of us to source for something outside our current circumstance. That whole "thinking outside the box thing" suggests this. It invites an approach to problem solving that asks us to go where no man probably has gone before (or at least forgot they've been) as suggested by Albert Einstein, "You cannot solve a problem at the same level of thinking at which you arrived at it." In demystifying creativity then, it can be seen as a simple act with a profound impact! We just need to uncouple the complications and misunderstandings that have been created around it. So in order to address our corporate challenges of process improvement, developing a competitive edge, doing more with less, achieving new and better outcomes creativity must be embedded in every work culture in a way that is approachable and practical. We must be able to help all stakeholders see that we all exhibit creative thinking in some way and then be trained on how to channel that capability into meaningful contexts for both corporate and professional success. Also - take a listen to an interview with Billy the Brain on KKZZ - 1400 NPR Done Right - Greater LA on his topic block of creativity. The interview block also included Peter Tork of the The Monkeys! Excellent! The home environment can stymie and/or enrich learners. Conscious accountability as well as reinforcement comprise two key components of a learner-friendly ambiance which thrives on creative thinking. Great timing for this article to appear! Thanks for sharing! Great point Darryl - nurturing the creative mind begins at home at an early age.